Please refer to our stock # mdl9 when inquiring. 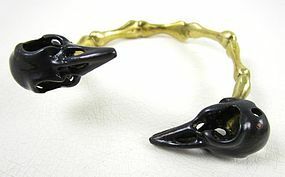 This unusual cuff bracelet has an edgy and modern look that will get a lot of attention when worn. Each raven skull head is 1 1/4" long x 3/4" wide and the interior opening is approximately 6 1/2". The brass metal is pliable and can be adjusted to fit most average wrists. It is in excellent condition.